FIGURE 13-7 Presentation of the cyclical hormonal changes throughout the human menstrual cycle for luteinizing hormone (LH), follicle-stimulating hormone (FSH), progesterone, 17-hydroxy-progesterone (17a-OHP), and estradiol (E2). 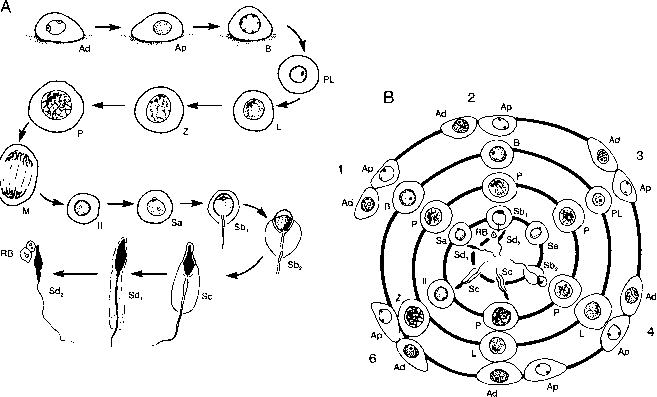 The cyclic changes in hormones diagrammed in this figure should be correlated with morphological changes of the follicle-corpus luteum and endometrium illustrated in Figure 13-8. The inhibin data were abstracted from McLachlan, R. I., Robertson, D. M., Healy, D. L., Burger, H. G., and de Kretser, D. M. Circulating immunoreaqtive inhibin levels during the normal human menstrual cycle J. Clin. Endocrinol. Metab. 65, 954-961. The top five panels were modified from Thorneycroft, I. H„ Mishell, D. R., Jr., and Stone, S. C. (1971) (1987). Am. ]. Obstet. Gynecol. Ill, 947-951.
than the postovulatory or luteal phase; the latter is remarkably constant at 13 ± 1 days. FIGURE 13-8 The sequential changes throughout the human menstrual cycle of the follicle-corpus luteum are shown in relation to the changes in the thickness of the endometrium. These morphological changes should be compared to the cyclical hormone changes presented in Figure 13-7.
cycle in relation to the morphological changes occurring in the ovaries and uterine endometrium. The multiple factors controlling the release of GnRH by the CNS-hypothalamus throughout the menstrual cycle are not clearly understood. As diagrammed in Figure 13-7, throughout the menstrual cycle there are significant changes in the ratio of FSH to LH. From days 1 to 10 of the cycle, FSH blood levels and LH levels are approximately equivalent. Then at days 12-14 LH rapidly becomes elevated to a very large peak or surge on the day of ovulation; blood levels of FSH are also moderately increased at ovulation, but not to the extent achieved by LH. Throughout the luteal phase the levels of FSH are low, while LH levels are relatively high on days 14-18 and then fall to low levels in the absence of fertilization and implantation by day 28. The dominant hormonal changes of the menstrual cycle, particularly in the uterine endometrium, are mediated by the steroid hormones secreted by the ovaries and corpus luteum (see Table 13-3). Associated with the cyclical changes in the gonadotropins described in the preceding section are related changes in the blood levels of estrogen and progesterone. In the early preovulatory or follicular phase, estradiol levels remain low until ~7-8 days before the LH surge. Then estradiol increases and reaches a peak 1 day before the LH surge; next, there is a drop in estradiol at days 14-16, followed by a rise to a second peak at days 20-26 (see Figure 13-7).